This morning, Crystal Research's CEO Jeff Kraws was invited to participate in a roundtable discussion to analyze how investors should be reacting to President Obama's State of the Union address. The segment was hosted by Thomson Reuters' Rhonda Schaffler and also featured David Joy, Chief Market Strategist of Ameriprise Financial, and Craig Irwin, Senior Vice President at Wedbush Securities. Crystal Research Associates' August 2012 nanotechnology update is now available here. This report is part of our ongoing coverage to our initial comprehensive industry review, Nanotechnology and the Built Environment: The Transition to Green Infrastructure, published November 2011 and available at www.crystalra.com. The U.S. Green Building Council (USGBC) recently reported that over two billion square feet of existing commercial projects are now LEED-certified across 130 countries and 50,000 projects, including most notably the commercial interior for Google in Mumbai, the Vestas Technology Center in Lem, Denmark, as well as the Ernst and Young Plaza in Los Angeles, California, among others. Amid a depressed global economic environment, investments in cleantech were estimated to total $1.6 billion in the second quarter 2012, down from $1.9 billion in the first quarter 2012and $2.1 billion in the comparable year-ago period (second quarter 2011). Factors driving down investment include global economic uncertainties as well as political opposition to government subsidies in areas such as solar and wind power and electric vehicle development. A depressed U.S. IPO market is further hampering greentech funding efforts. As researchers have recently emphasized, governments have a significant role and responsibility for providing long-term support for renewable energy, smart grid, and other future “sustainable city” initiatives. The price of renewable energies and associated technologies are too high to appeal to investors without government support. Mechanisms such as incentives, feed‐in‐tariffs, tax‐breaks, rebates, and other financial instruments are critical. With that in mind, we have released a 12-page report that expands upon several U.S. policies expected to further market adoption of sustainable, nanotechnology-driven technologies. 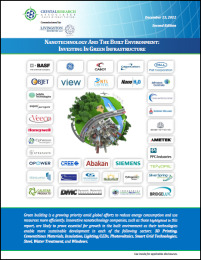 The report, Continuing Coverage of Nanotechnology and the Built Environment (available here), is the latest update to our base report, Nanotechnology and the Built Environment: The Transition to Green Infrastructure. This update is part of a series of “continuing coverage” reports from Crystal Research Associates that detail innovations in nanotechnology and their impact on our infrastructure, building, and construction markets. A March 2012 report from RNCOS (an industry research firm) forecasts the global nanotechnology market to reach $26 billion by the end of 2014—representing a CAGR of roughly 19%—driven by expansion of nanomaterials, nanofilms, and nanodevices in all sectors of the economy, including throughout the built environment. At present, the U.S. remains the largest market for nanotechnology, although many other nations (Brazil, India, and China included) are making sizable investments in R&D for this field. In less than a decade (since the 21st Century Nanotechnology R&D Act was signed into law on December 3, 2003), the U.S. has spent $24 billion on nanotech R&D. Worldwide population growth, continued geopolitical conflict in oil-producing regions, volatile energy prices, and heightened concerns of climate change are fueling demands for energy efficiency—specifically for products that can cut energy consumption and costs, reduce dependence on oil, and reduce emissions of carbon dioxide and other harmful greenhouse gases. According to Inc. Magazine, commercial and residential buildings account for nearly 40% of energy used in the U.S., with an estimated 52% of CO2 emissions tied specifically to the built environment. Thus, “greening up” the U.S.’s buildings, roads, and other infrastructure represents a big challenge and, concurrently, a big opportunity going forward that we here at Crystal Research Associates are excited to watch. But the greening of America is not the only trend that we expect to impact U.S. building in the coming years. In parallel with a global movement toward more energy-efficient, sustainable products, much of the infrastructure in the U.S. is reaching the end of its lifecycle, necessitating either repair or new, improved construction. These needs for both greening up U.S. infrastructure as well as for retrofitting the existing built environment are being achieved throughnanotechnology, which is shaping up to become a driving force for innovation and sustainability in the 21st century and beyond. Nanotechnology enables new approaches to solving many of today’s social, economic, environmental, and infrastructure concerns, and in doing so, is changing the landscape of virtually every aspect of the built environment. The potential benefits of energy-saving, ecofriendly, nano-based materials are considerable. Fueled by an array of such startups and new technologies, the global market for green building materials to date has become a $156 billion industry per year.